Black Hills Silver Hoop Earrings by Black Hills Gold Jewelry at Sherlock Coat. MPN: MRL01015. Hurry! Limited time offer. Offer valid only while supplies last. SilverLeaf Black Powder Coat Hoop Earrings with 10k gold posts and friction backs. The10k gold with Black Powder Coat has etching that shows gold. SilverLeaf Black Powder Coat Hoop Earrings with 10k gold posts and friction backs. The10k gold with Black Powder Coat has etching that shows gold. 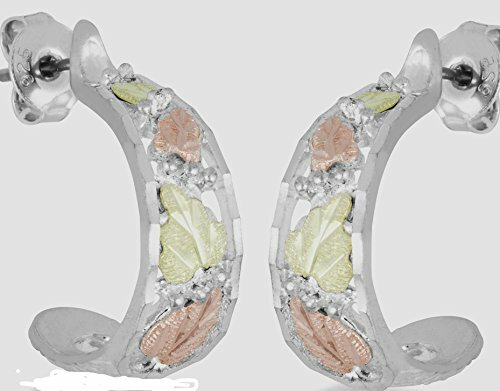 Petite Hand-Engraved, Hand-Placed, Satin Finished 12k Green Gold Grape Leaves and 12k Rose Gold Grape Leaves with gold etching. Designed just for you in S Dakota USA. Earring Measures .81" inch by .26" inch. Usually Ships in 2 Days. Certificate of Authenticity and Manufacturer's Limited Lifetime Warranty Included. Silver Leaf Hoop Earrings with 10k gold posts and friction backs. The10k gold base with Black Powder Coat has etching that shows gold. Petite Hand-Engraved, Hand-Placed, Satin Finished 12k Green Gold Grape Leaves and 12k Rose Gold Grape Leaves on diamond cut 10k gold vines with grapes on a Black Powder on 10k Gold base. Earring Measures 0.81" inch by 0.26" inch.Usually Ships in 2 Days. Ladies 0.8in 0.925 Sterling Silver 2 Photo Heart Locket with Diamond Accent Pendant 3.3mm Cable Necklace, 18"